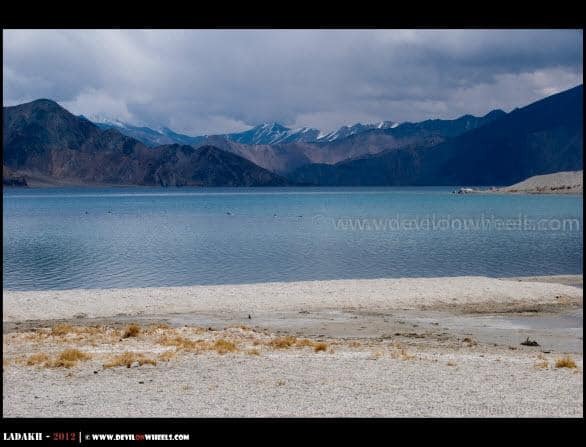 The beautiful multi shades of blue colour offered by this lake along with a picturesque landscape around gives this place an extremely romantic feel as shown in Bollywood film songs. However, sitting behind the TV/LCD it looks so but in actual reality the place is extremely harsh and difficult to survive especially in winters. There is only one cemented accommodation available around the lake and the facilities like electricity, medical aid, hot running water, western toilets etc. are rare to find. The lack of oxygen makes survival difficult if your body is not properly acclimatized to its high altitude and hence, one need to plan his/her journey extremely carefully to make it acute mountain sickness free vacation. 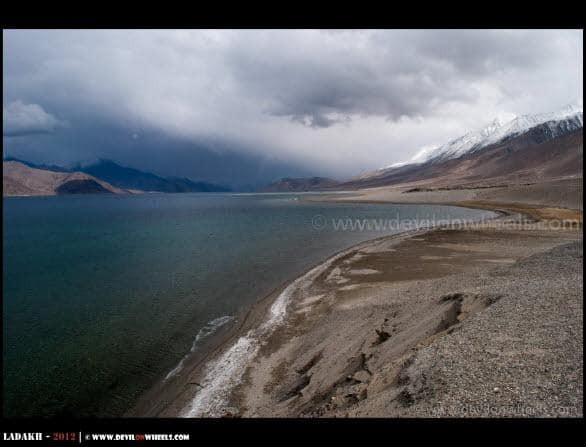 Now, coming back to story, after some 15-20 minutes enjoying around the spine chilling cold water of Pangong Tso, we decided to move ahead along it towards Merak – Man – Spangmik – Lukung. 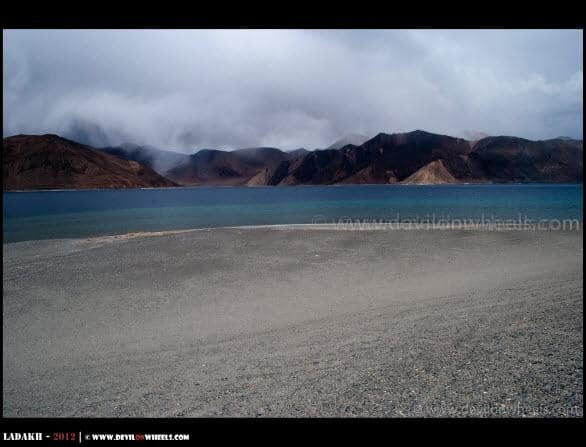 Pangong Tso runs all the way upto Lukung along the road, giving you a felling out of the world. Every few yards, your heart will say to stop and click some pictures or stand by but time is an elusive killer of your wonder feelings here 🙂 … We kept moving, then stopping, then moving all along the way and there were some beautiful sceneries, so remote, so pristine, so colourful and in my mind "I was thinking that “I am not sure what I am missing without sunlight but whatever I seeing I cannot imagine to be more beautiful unless another trip in sunlight”… Looking back and I can see another trip in the making soon 😉 … Well, we ran through Merak village where the site for world’s largest Telescope has been approved and apart from Hanle there will be another observatory very soon in this clear sky region of Ladakh. At some of the sections snow was still present on the road and we did have to inspect the conditions to pass-by as we were running alone on that route for the entire length od the day. Each time, Rigzin gets out of the car to inspect the conditions I jumped out for another opportunity to click some lovely shots. We passed by Spangmik village, where all the tented accommodations were setting up their tents and pipelines for western style toilets. 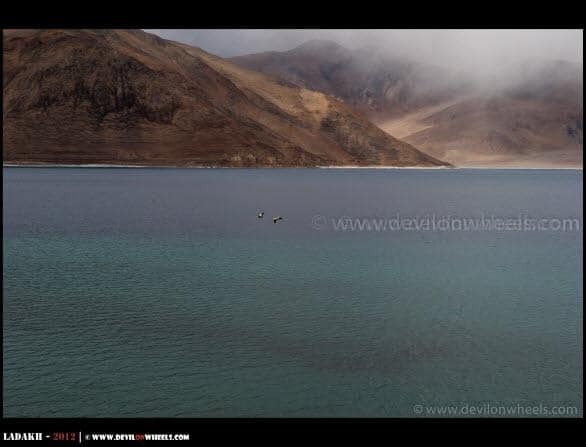 Another, lovely sight to pass by and finally we could see Lukung where the whole of Pangong Tso was frozen and I asked Rigzin to stop aside in hopes of getting some sunlight and some deep bluish beautiful colours out of Pangong Tso. 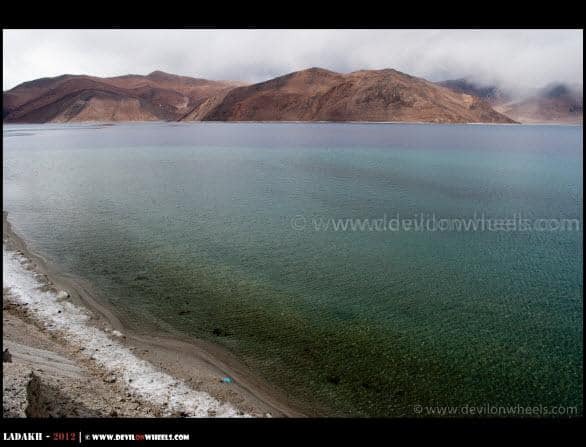 We stopped for about 45 minutes or so, on a small hill top offering panoramic views of entire Pangong Tso, waited but weather was not on our side that day. Running Through the Snow… Again!! 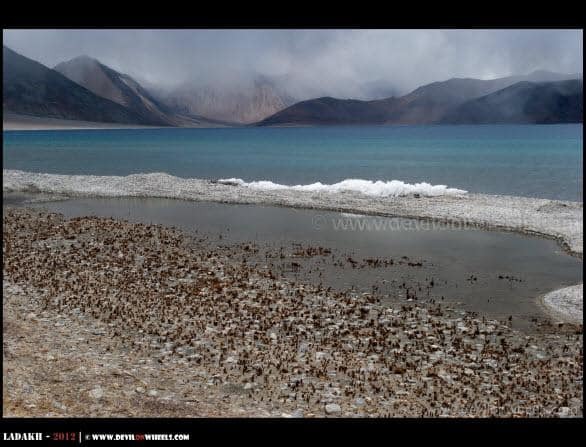 We decided to move on towards Lukung where the Pangong Tso was completely frozen and yes, the famous “3 Idiots” scene was shot. 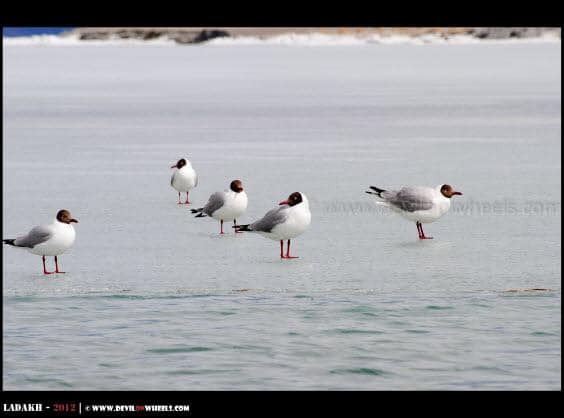 There were so many Seagulls present near the shore of the lake and we had nice time feeding them and capturing some wonderful shots with them. 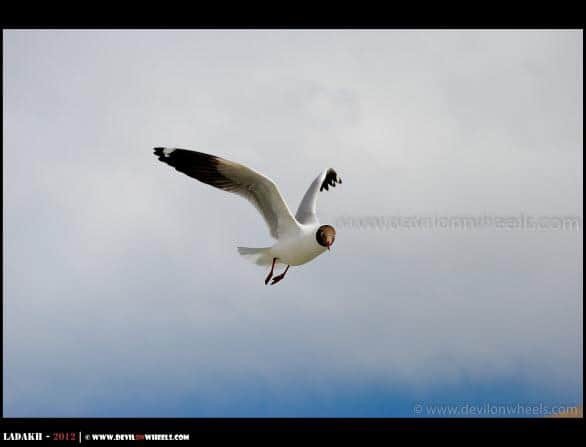 They were so sharp and quick to catch the throw biscuit in the air, it was fun filled 30 minutes or so. 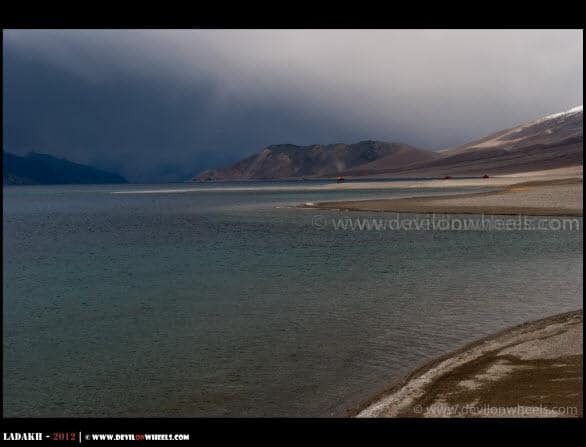 Not to forget, generally, people coming through Travel agents were totally disappointed by seeing the frozen Pangong Tso and as the drivers were reluctant to take them ahead about 15-16 KMs to show them its really beauty. I think this is one of the major disadvantage of opting for Travel agents because the drivers have strict directions to follow and that makes your plans more rigid and disappointing as well because to most of the tourist the direction was to show them the 3 Idiots film shooting point, nothing else and being frozen, it was a disappointment for the tourists for sure. Our plan was not fix enough and we still had time to cross Chang La but we had different plans in my mind. 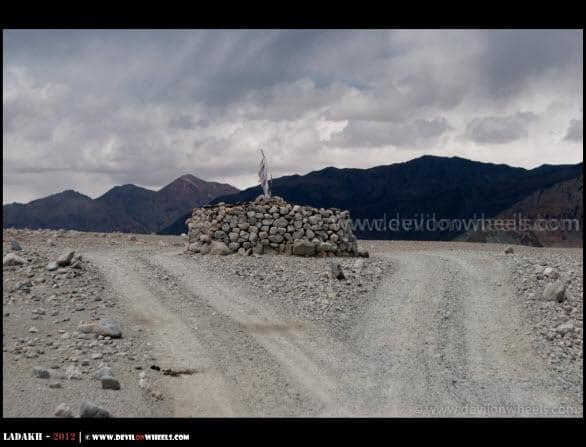 I asked Rigzin to stopover at Tangste and ask locales about the route conditions of Shyok Village route to Nubra Valley. 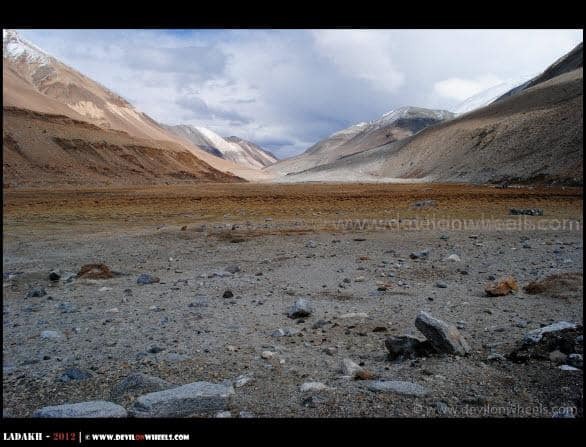 If the locals say no, then we will cross Chang La today itself and go to Leh for overnight stay. 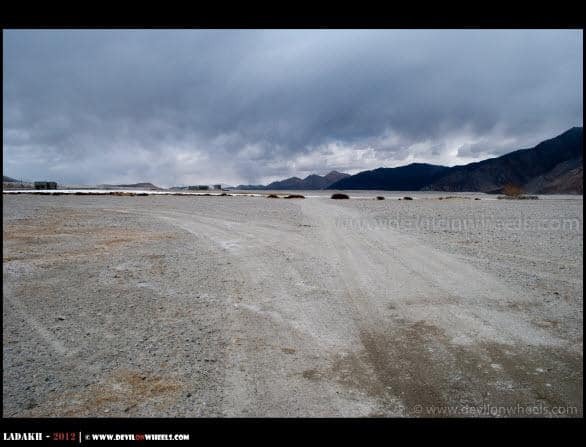 Otherwise, we will head to Nubra Valley from Tangste via Shyok Village next morning and if we see any concerns we will come back to Chang La route. We even decided to take a backup vehicle with us from Shyok Village but all these were plans and with hopes in our heart we moved on towards Tangste. 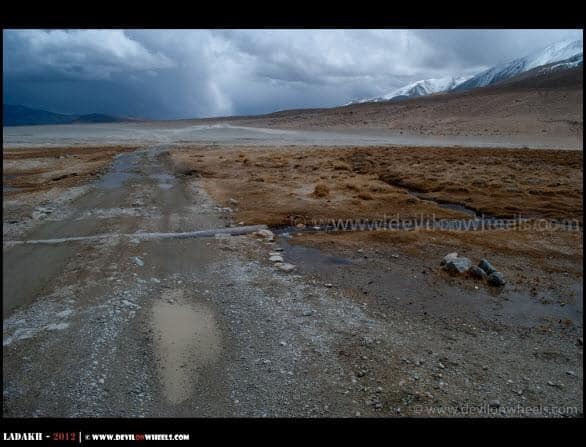 I so desperately wanted to do the Shyok Village route to Pangong Tso. Road ahead of Lukung is all tarred up to Leh barring few patches in between, so it was a very welcome relief for our body which got full body massage since morning ;)… On the way, we met the Marmots, had lovely time feeding them as with Seagulls and mind you it makes you so close to nature seeing and interacting these wild animals and migratory birds of Himalayas. Finally, we reached Tangste and stopped at Yakmik Changla Guest House and ordered lunch. 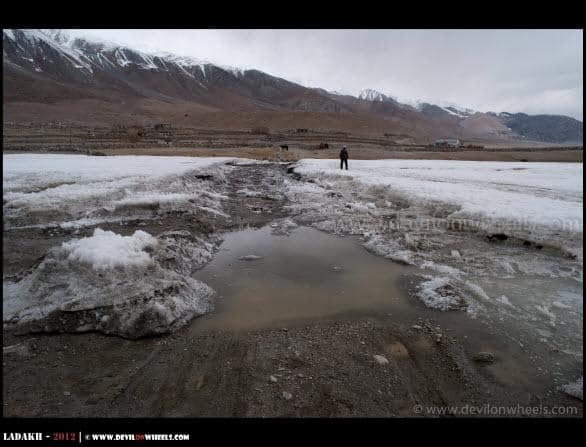 Meanwhile, Rigzin inquired about the conditions of Shyok village route and they told us that with careful driving a Scorpio can make it. 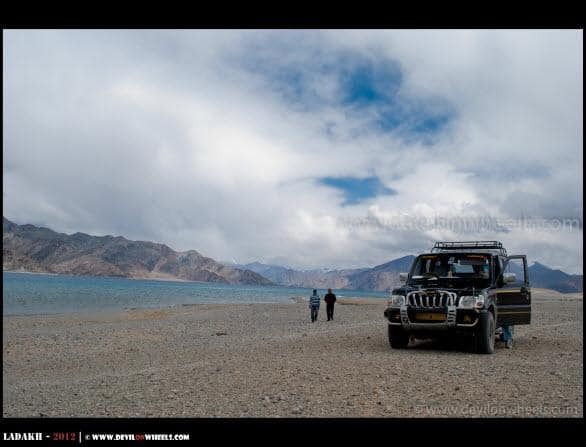 This boosted our morale to quite an extent and we knew that we will be dashing into another unknown territory day which was even not known to our experienced Ladakhi driver. This raised the adrenaline to high levels and despite too much of cold conditions outside, me and Himanshu decided to have a walk around the village after the tasty lunch cooked by the lady at the guest house. Rigzin was still in doubts but he also wanted to take on the challenge and drive into the unknown with 3 idiots like us and we kept boosting his morale with all sought of mitigation plans 😉 … The only issue with the guest house is that bathroom is shared but since, we were the only one staying at Tangste at that time of the year, so it was almost like personal to us. We rested for couple of hours and then went for the dinner in a room where bukhari was running and maintained the cold freezing temperatures at warmer levels. 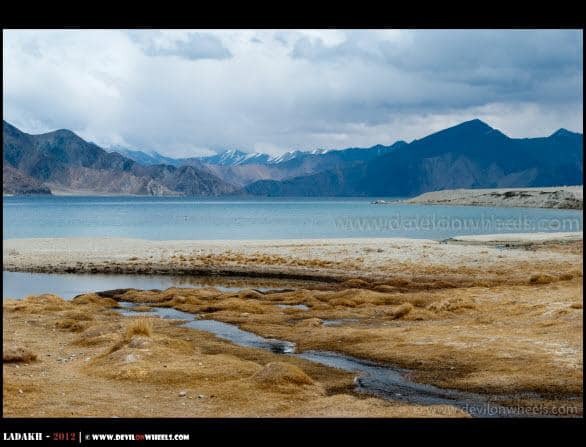 With dinner, we watched TV for a while and after saying goodnight to Rigzin, we went for sleep again dreaming of the unexpected adventure to happen on the Pangong Tso to Nubra Valley route via Shyok Village. Shaheen, Best wishes for the trip and if by chance you happen to be happy to spread smiles, please support the initiatives of DoW Causes in order to help the local community up there in remote Himalayas. 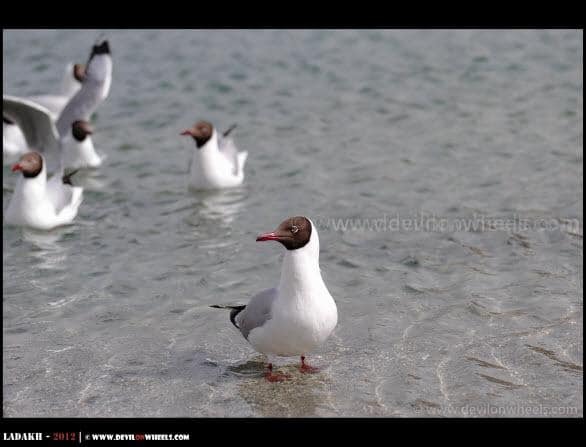 You can check more details about them at: DoW – Causes | A Step Towards Responsible Travel and can execute them on your own. Dear Dheeraj, I would be love to support the DoW Cause of Gyaan 500. Could you let me know the contacts of any schools where I could distribute the stationary? Thanks, Shaheen. 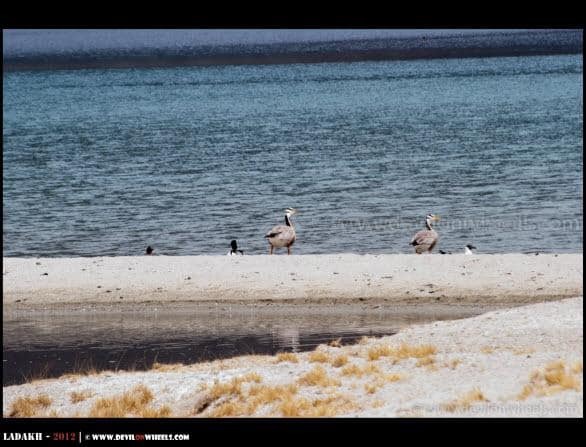 Shaheen, if you visiting Hanle then of course we do have a contact there but are you visiting Hanle? Else, you can also check with Mr. Rehman at Habib Guest House in Hunder, Nubra Valley 09469736543, 01980-221039, 01980-200344. Regarding how it can be contributed, yes, you can actually walk into any school you see over there in Ladakh and distribute the stationary items among children. I would suggest to execute in some small village like Hunder, Turtuk, Korzok, Spangmik, Sumur, Panamik, Hanle etc.. where the availability of such items is difficult unlike Leh or Srinagar or Kargil. First of all, accept my heartiest thanks for helping me to make this trip a grand success. 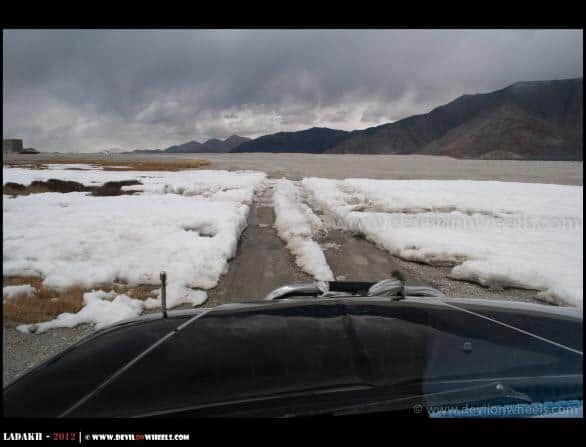 I would also like to share a word of caution for fellow travellers who are planning to go Tso Moriri directly from Pangong Tso following Chusul-Tsaga-Loma route. We opted for this route but eventually denied by the Indian Army at Chusul to proceed further. They cited us the reason being the recent Chinese incursions and thereby security threats to the civilians. 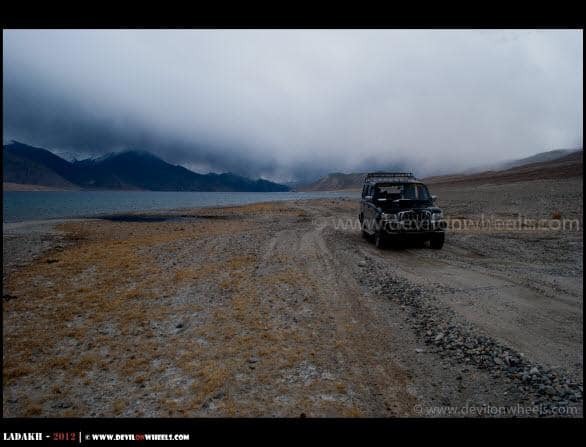 We again had to get back to Leh from Chusul and go for Tso Moriri next day. The Leh DC office is totally unaware of this and continues to grant necessary permissions for this aforementioned route. 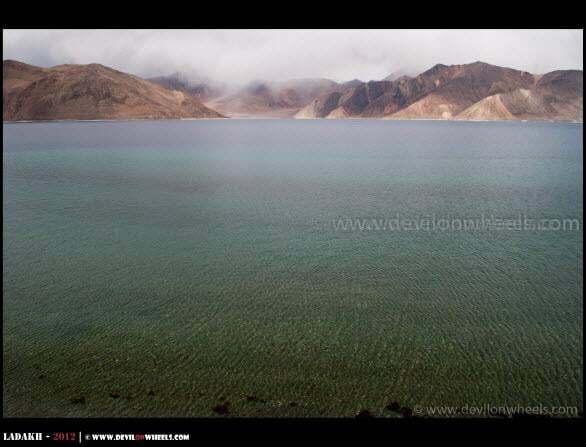 So guys, visiting Tso Moriri directly from Pangong is a strict no no (through the remote terrains we covered from Pangong till Chusul is a big time wonder). Now about AMS. This word has been a catalyst of big tension for me prior to the trip. Fortunately, there weren’t any such issues happened to us, except mild headaches on our first night at Leh. I guess travelling through Srinagar helped us a lot to acclimatize faster. We didn’t even spend a complete rest day at Leh. 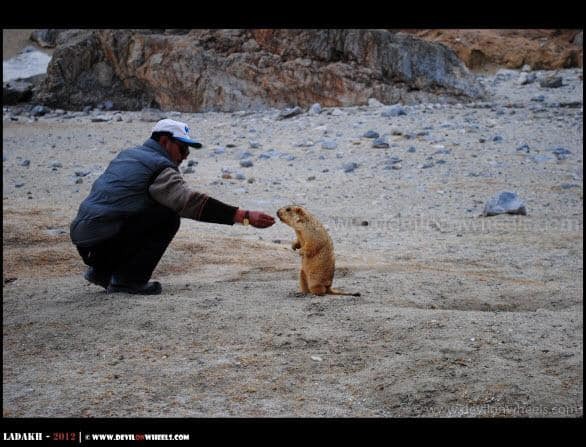 To sum up, our experiences at Ladakh is an exceptionally good one. The place, its people, contours, colours, each and everything is sure to captivate us for a long, long time. How is juniour? Give my love to him. Jags, thats a great update!! Thanks for sharing it back here. Junior is doing great brother, keeping me on toes and running around after him. 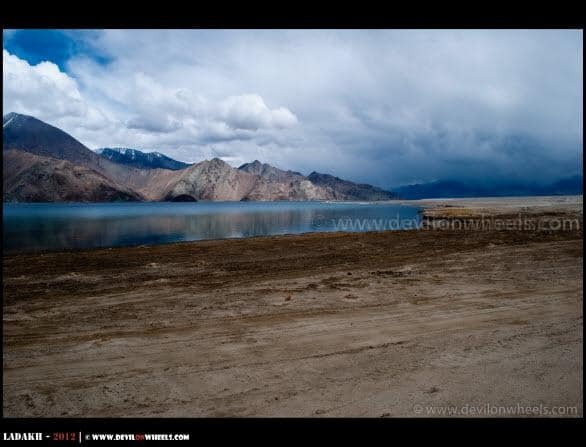 Planning a Leh Ladakh trip soon …would May be a better time to travel or September??? Mohini, Thanks alot for liking the pictures and the article. 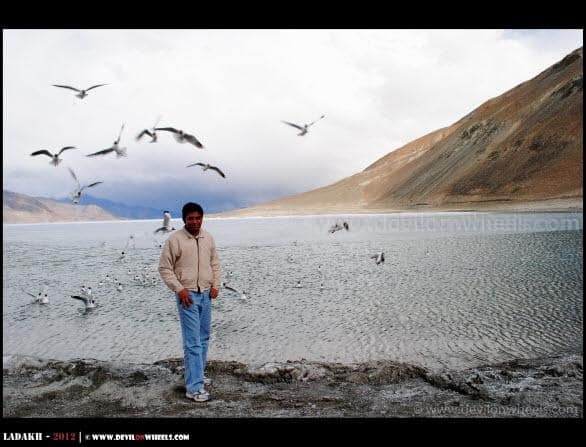 Best time for me is September but May is not bad if you are directly flying to Leh – Ladakh. Interesting captures and equally good description. 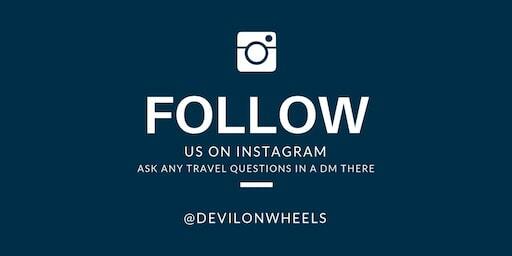 I an my Friend are planning a trip from Delhi-Manali-Leh-Kargil-Dras-Srinagar-Delhi in May-June by ourselves. Woo…. Excited!!! Thanks Dude for sharing the pictures. I am eagerly waiting for the real Adventure Trip. Conditions would be lot colder infact very cold and all the accommodation option would be gone, so either a day trip will be possible or the stay at Tangste only. Roads would be on the verge of closure and snow, not sure. If possible only fresh snow at some high mountain pass will only be available if at all. I’ve been wanting to go to leh ladakh since 2 yrs but its not happening becuz of the same goddamned reason- group of ppl to go with. So this time i thot of going with sum tour grp. But again the same prob, the tour grp that was supposed to go in aug end, didn’t get enuf registrations. So right now im looking for gud reliable groups i can join for leh ladakh trek..for maybe 10-13 days starting frm around 31aug-4sept. Thanks amit!..thats gud news…but one my issues is still unsolved..i need a travel group to go with…none of my working frnds can get leaves for 10 days…so…Dheeraj,, can u plz help??? I hope my earlier reply was some help at lest within Leh. Well, else you should check Travel Partners section on IndiaMike or BCMT. 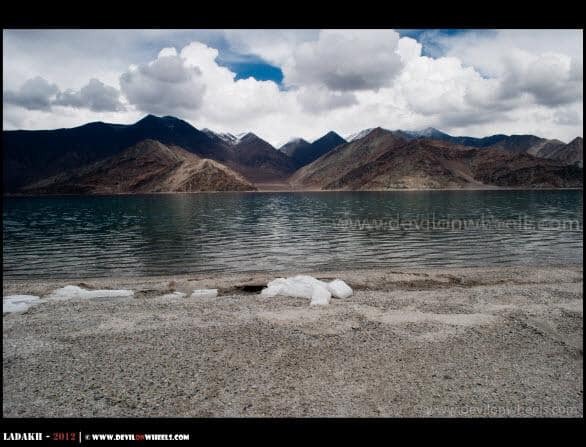 For traveling between Manali – Leh, you can rely on HPTDC bus service which includes the accommodation as well. To Travel to Jammu, train would be best option and then the only problem will be traveling to Srinagar which you need to either take some taxi or JKSRTC bus service. You will find shared taxis from Srinagar to Leh anyway. Hey thanks dheeraj, yeah now thats the only option..going solo :(…safety maybe n issue, but when’s it not!!! I juz want to enjoy my journey more than worrying about hotel bookings n travelling costs…If i was going with a group, all that wud be taken care of…. Can you plz send ur mobile number on my email id??? Yeah, safety might be concern while traveling solo and you are right – when it’s not, even right here in Delhi 😀 … However, once you are close to Ladakh then you need not worry about much as it is one of the safest places in India 🙂 … You can even join up a group or several groups (on various trips) once you are in Leh and rest will be taken care by the Travel agent organizing the trip, if you like. You will be getting my email as I am replying to the comments, if not please check you spam as well. I have forwarded my contact details to you as well. Gr 8 pics!! !,as well explained !!! 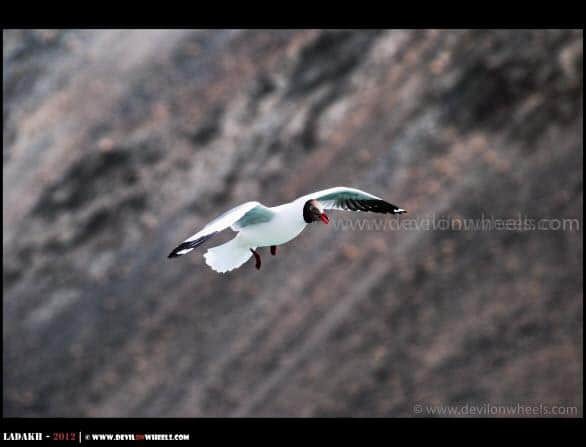 which gear used for clicking n set of lenses also ,am planning a trip !!!!! Thanks alot brother!1 I use D3000 with 18-55mm and 70-300mm lenses and a Hoya CPL. 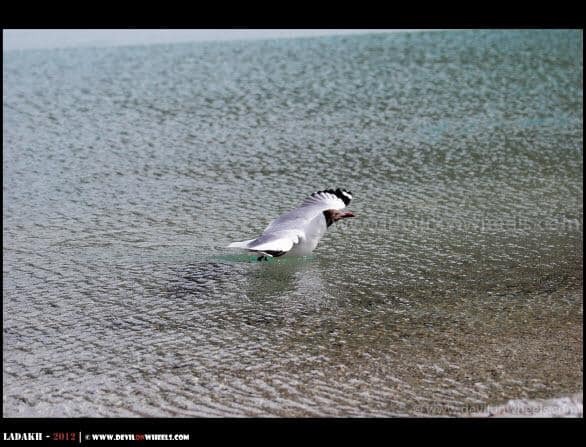 The first image of birds titled migratory birds are Bar-headed geese. In which month had you gone there? Nice images and description. 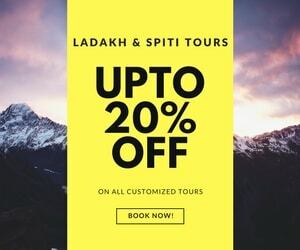 Your post helps me in connecting with ladakh again. Awesome pictures..picture perfect!!!! 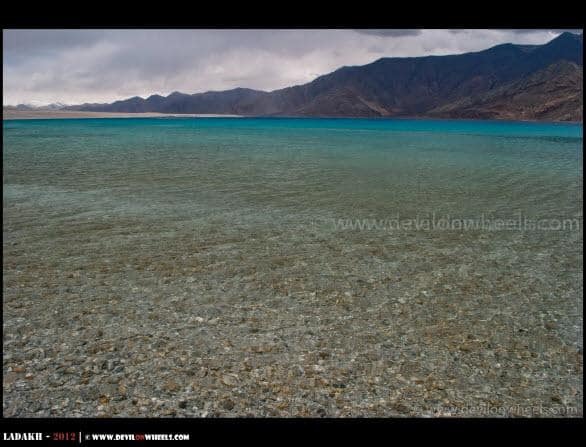 !..will be planning to be there very soon..
You left us in doubt of the mesmerizing serenity and beauty of Ladakh. Loved the panorama of images. Great share. Ha ha ha, thanks alot but it is the place that has all the magic in itself. Sir is there any website which can guide for remote areas near srinagar like gurez valley near bandipore? This is pristine paradise. Better , it is mostly in accessible, else too many will flock to spoil it. Thanks once again and thanks for reading the story and providing your comments constantly 🙂 … Well, you are true to some extent otherwise, irrespective of what it can cause harms as AMS, this terrain would be tried by lots of honeymooners for sure in winters, if accessible easily with less cold. 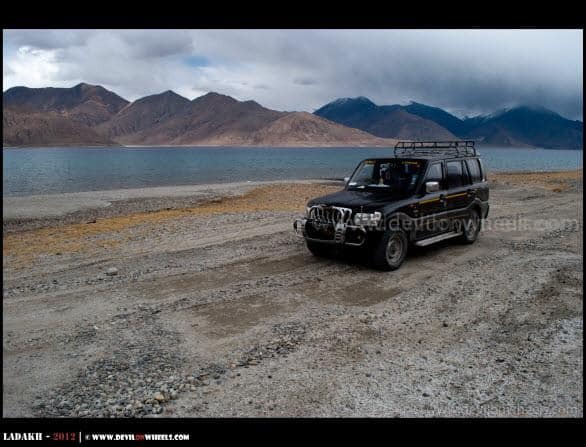 And, currently the initial section of Pangong Tso i.e. 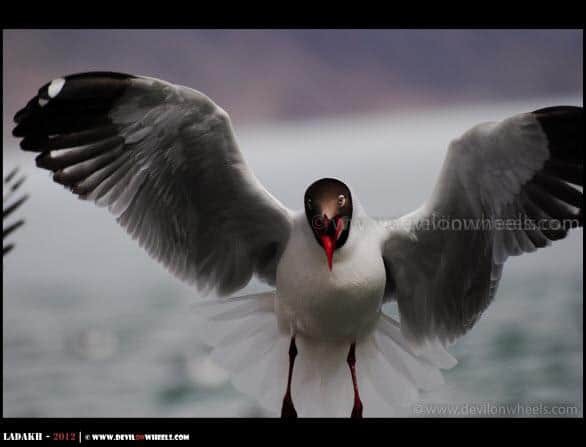 Lukung to Spangmik, is completely spoiled in tourist season time by the herds of irresponsible tourists, polluting it, throwing what not into this pristine lake and what not. Tourism is good but people shall take complete responsibility of such our environment and its beauty, which I am afraid is not the case. I am only armchair traveller, and am thankful for your kindness in sharing those wonderful places, enabling me to view them. There is army, government,a nd tourist operators, can they all together engage the people and make them understand why it is necessary to keep the place pristine? I feel bad about people spoiling the environment. I hope some one will care. Once again, have a good time ,a and keep sharing. Thank you so much, these words would surely make my day today!! And about tourism and spoiling the mother nature, well, that is the sorry state of our mindsets, I believe. It is extremely hard to make people understand the importance and unless there is some CSR/NGO gets involved, this does not work out. 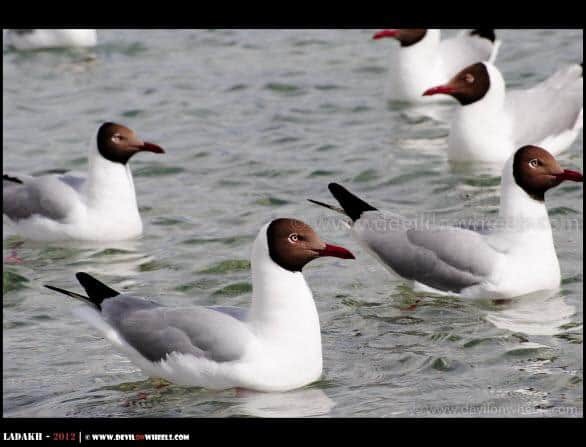 They all feel, ,nothing will happen if I throw a piece of plastic in a lake, who cares!! But, yes you can always embarrass them by picking that piece of plastic out in front of them and giving them that ugly stare in disgust 😉 … We always try to do that!! Sure, then keep the last week of September booked brother, I saw the email, will reply today 🙂 … Quick fact, if you can spend some more money then go with 70-300 not 55-300. It is lot faster and well accepted lens when compared to the new one. 55-300 is quite slow at zoom end. Ok, let me check the specs. of 70-300, but what about the gap from 55 to 70 mm? Thank you so much Anjali, glad you liked it. Yes, this one really was one of the best moments we had in the entire trip. 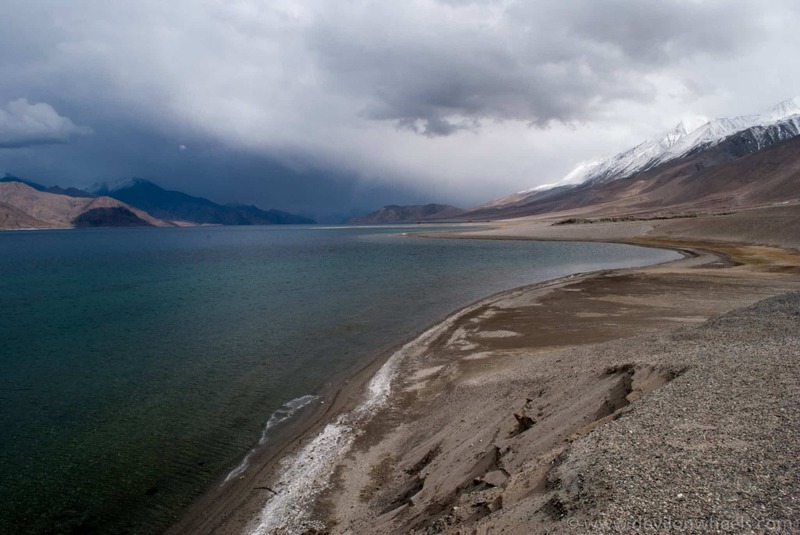 Running along the shores of Pangong Tso was a feeling in itself.